All-age corps from across the country are gearing up for the start of the 2006 Drum Corps Associates World Championships on Sept. 1-3, in Rochester, N.Y. More than 50 all-age organizations will take part in three days of events which include an individual and ensemble competition, an alumni corps "spectacular," and preliminary and final field competitions between participating corps. 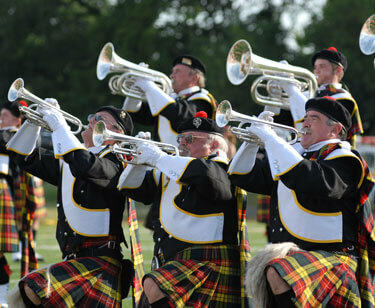 The Kilties, seen here performing at the DCI Father's Day Kickoff on June 18, in Lisle, Ill., will participate in the DCA Championships. Tickets range between $15 and $30 for the various events and can be ordered at the stadium box office. More information is available on www.DCAcorps.org.